Do you drink fruit juices on a regular basis? Fruit juices have the 5 Star Health Rating so that’s healthy, right? Generally the Health Star Rating System is a good way to work out how healthy food and drinks are but sometimes it is too simplified. 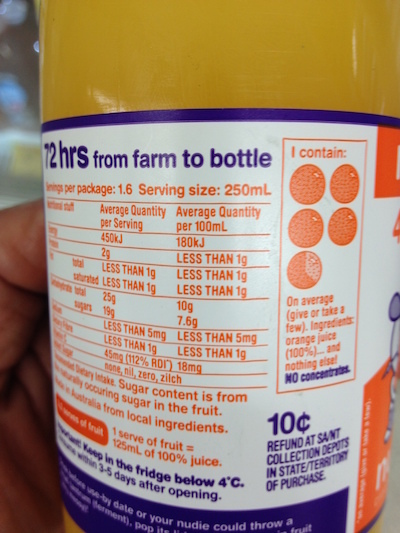 Most bottles of fruit juice will have a 5 star rating on it. However, if you look closely at the photos below it may shock you to find out how much sugar or energy are in a 400ml bottle. 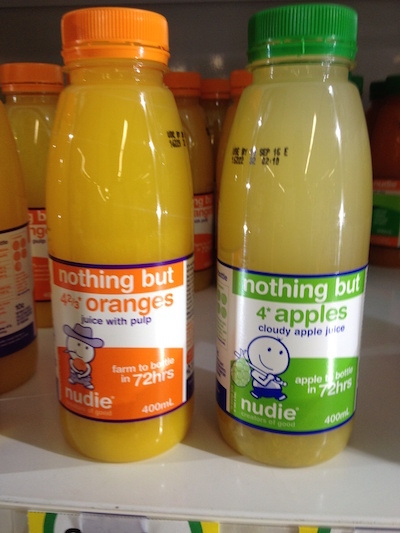 It takes 4 2/3 oranges to make 400ml of orange juice and 4 apples to make 400ml of apple juice. Fruit is good for you and for a balanced diet you are supposed to eat 2 serves of fruit each day. But would you ever eat nearly 5 oranges in less than one minute? Most 400ml of fruit juice contains 30 to 35g of sugar – that’s equivalent to 6 to 7 teaspoons of sugar. It also has around 720 kilojoules of energy. A can of Coke has 40g of sugar and 675k kilojoules. If you like drinking fruit juice try and limit it to no more than 200ml per day. Or eat fruit instead – it contains fibre for digestion and also make you feel fuller. Health Jigsaw is a well trusted mobile personal and fitness training business and our personal trainers have been helping clients get fitter, stronger, faster and healthier since 2004. Apart from putting together effective workouts, we can help you with nutritional advice. A healthy lifestyle is not just about exercising – nutrition plays a big part too. You will not get results unless you are committed to both exercise and nutrition. Contact us for a complimentary initial consultation if you live in the following areas of Southern Tasmania: Blackmans Bay, Crabtree, Cradoc, Cygnet, Franklin, Glen Huon, Grove, Huonville, Judbury, Kingston, Leslie Vale, Lower Longley, Lucaston, Mountain River, Ranelagh, Sandfly, South Hobart, Taroona, Woodstock.